The Fincher family has been smoking BBQ in Middle-Georgia for 81 years. The first fire was started back in 1935 by Doug “Dude” Fincher, Sr. then two more generations of Fincher's followed. All barbecue men. All family. All working in the same smokey space over distinctly different eras. In 1935, Douglas "Dude" Fincher, the only Lanier high school student to receive four (4) letters in football opened the flagship store on Houston Avenue after he lost his job at a local mill in Macon. In 1947, Fincher's namesake, Doug Jr., was born and later married Alice Grace Gautier in 1969, and together they too owned and operated Fincher's Barbecue and Catering. Big Doug took a modest barbecue joint and turned it into a prosperous business with his wife at his side for 43 years. 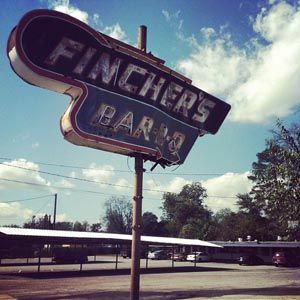 Under Doug Jr.'s stewardship, Fincher's Barbecue gained a reputation for barbecue that was "out-of-this-world;" literally. Fincher's motto, "First in Space, Best in Taste!" was established when Mr. Fincher, together with his Lanier classmate, astronaut, and Fincher's Barbecue fan Sonny Carter, had the vision and desire to add barbecue to the space program's shuttle menu. When Space Shuttle Discovery lifted off on November 22, 1989, on NASA Space Mission STS-33 - it carried with it Fincher's ​wood-smoked ham. Doug Jr. or Big Doug as most would call him, passed away in 2013 at the age of 66, leaving his legacy to Alice and their two sons and all eyes have turned to sons Jake and Doug III to keep the pit lit and the family business rolling. Located at the end of the counter sits an empty bar stool with a plaque that is a memorial to Big Doug. Ms. Alice talks with customers about Big Doug as if he’s still working the pit, that’s how much influence Big Doug still has. He may not be in the restaurant, but he isn’t gone. Happy Birthday Fincher's and here is to 81 more years!